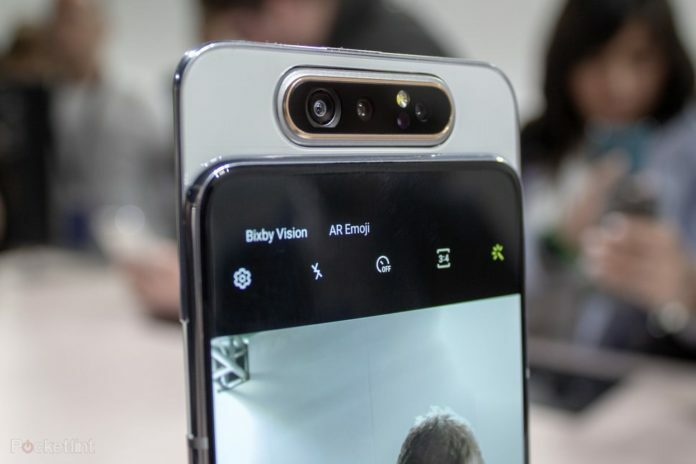 Samsung made the front-facing camera seem even less noticeable with its “Infinity-O” hole punch display on the Galaxy S10, which allowed the phone maker to extend the size of its flagship phone’s screen without compromising the camera. The Galaxy A80, which Samsung announced on Wednesday, has three cameras that pop up from the back of the phone and rotate when the camera app is in selfie mode. The camera system is comprised of a 48-megapixel main camera, a 3D depth sensing camera, and an ultra wide angle camera, the latter of which first appeared on Samsung’s Galaxy S10 line. Besides its slide-out, swiveling triple camera system, the Galaxy A80 also features a 6.7-inch (17cm) 1080 x 2400 resolution screen and a 3,700 mAh battery that supports fast charging. That means the Galaxy A80 has a screen that’s larger than those found on the Galaxy S10 and Galaxy S10+, but the same size as the Galaxy S10 5G’s display. Like many of Samsung’s recent Galaxy phones, the Galaxy A80 includes the company’s Bixby digital assistant and its Knox security platform. There’s also an on-screen fingerprint sensor, which, like the ultra-wide camera camera, also first appeared on Samsung Galaxy S10 line. It will be available in three colours: black, white, and gold. The Galaxy A80’s unconventional camera is one of many workarounds phone makers have invented to nix the front-facing camera in favour of more screen real estate. Chinese smartphone giant Oppo, for example, just announced a new flagship phone called Reno with a camera that pops out in order to allow for a borderless, notch-free design. Vivo, another China-based smartphone company, also announced a new phone with a 32-megapixel pop up camera earlier this year. Samsung has yet to announce for the Galaxy A80, but The Verge says it’s scheduled to launch May 29th.